The Wonderful Pomegranate is known for its plentiful juice and tangy sweet taste. The arils of the Wonderful are a bright ruby red color which contains powerful antioxidants, vitamin C, vitamin K and fiber. They are great for snacking and for use in recipes. The tree is ornamental and makes a beautiful addition to your yard. It also works well as a container-grown plant that will enhance your home's decor. 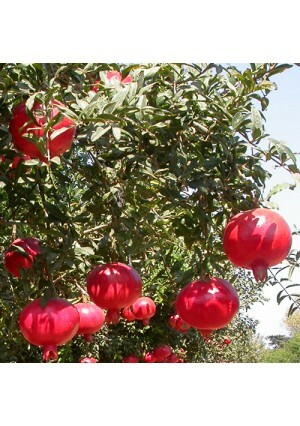 Pomegranates are best kept in a well draining soil such as a Cactus or Citrus Blend. Pomegranates are deciduous trees and will shed their leaves in the fall. They prefer full sun for the best fruit production. Pomegranates are cold hardy in USDA Zones 8-11. Wonderful Pomegranate Trees blossom in the spring. It should be noted we do not ship with fruit on them. With a juvenile tree, we recommend foregoing fruit the first year or two to allow the tree to become more established. The tree will be more capable of producing quality fruit with this practice. Pomegranate trees aren't just extremely attractive to look at; they also bear delicious purplish red fruit. If you're thinking of investing in a pomegranate tree, it's important to make sure you know how to take care of it in order to give it the best chance of thriving. Pomegranate trees originate from hot, arid lands and need to be protected from fresh and severe weather – some people grow their pomegranates indoors; in some areas it's possible to leave your pomegranate tree out for part of the year, then bring it in when the thermometer starts to fall. The pomegranates we have for sale at our established company work well in containers – just make sure the pot is the right size to accommodate the roots and allow a little extra room for growth. Experts recommend watering your tree generously about once a week. As the years go on, the tree may also need feeding periodically to keep it in top condition. Please contact us at 866-216-TREE (8733) if you have any questions, concerns or prefer to order over the phone. Email us anytime at support@lemoncitrustree.com.